[02:08:27] Conlan Day: ‘Does choice define identity’? Ironically, as I was talking to one friend about identity and who we are, Skins showed an essay question up on one of the whiteboards. “Does choice define identity?” The following is my essay that a friend and I wrote with each other at about 2am. If we never made any choices, then we would never have a personality. From the choice of when to wake up in the morning and the clothes we choose to wear, to the university we choose to go to and the job we choose to apply for. In turn, these choices we make define ourselves. If I wake up at 7am, part of what might be assumed is that I am a ‘morning person’. I enjoy mornings. If I wear a stylish dress and pretty shoes, it could be assumed that I am a girl who likes fashion. If I choose to go to Oxford, one might assume I am intelligent. If I apply to work for Centrica, one might assume I am interested in business. On the other hand, I could choose to wake up at 7am because I have a job that starts at 9am, not because I like mornings. I may choose to wear a dress and pretty shoes not because I like fashion, but because I work somewhere of which the social norms require me to do so. I may have not chosen to go to Oxford because I am intelligent and want to be in the surroundings which enable me to push myself the furthest, but because I live with my grandmother in Oxford and she needs taking care of. I might apply to Centrica not because I am interested in business but because it is a respectable company and I need the money. We can’t therefore, assume that that a choice someone makes means something specific about their identity. But is that just an assumption about the person I am? Should we not assume then, and take our choices to mean something entirely different – a path. The choices we make do not directly define our identity, but do so indirectly, by setting us down a pathway of which the person walking down it, is us. This path represents the environment. The person walking down the path represents us. When we walk along a path, we might encounter a rock, and almost fall over it, but carefully move around it. Moving around the rock was a choice we made in order to avoid getting hurt. Next time we see a rock, we might be more careful in order to avoid being hurt once more. (Whether this is an active choice or an example of a natural reaction is debatable here.) Therefore, the choice to step around the rock has made us more careful as a person. Part of our identity could be therefore a caring person. Despite this, one occurrence of one choice does not define who we are. Other days we may not choose to ‘step around a rock’ (metaphorically) in order to stop getting hurt, and thus the level is neutral once more. If we continue to step around rocks, that is when a conscious choice is being made to do so, and this reinforcement defines our identity, for example, if we are bored and decide to draw one Monday afternoon because it was fun and relaxing, then again on Tuesday, and Wednesday and Thursday, we could conclude that we like to paint (a part of our identity). It has to be multiple occurrences before it can be defined as a part of who we are. But then what is your definition of define? Surely define refers to a strong, never ending, fixed point, and surely identity is something that changes? We cannot be exactly the same people as we were five years ago; many things have happened to us since then which have altered the way we behave, speak, write, move. Identity is not a fixed point inside ourselves which can never change, it is something we always carry with us, and that is something that is ever changing. Just because we hate carrots as a kid, and that could be, a part of our identity… it doesn’t mean we will always hate carrots. Identities change. Perhaps then, what makes our identities change IS choice, which would lead the above statement to be true. For example, if we chose to try some food at a friend’s house with carrots in it, and really enjoyed them, then our active choice of having some of that meal has changed our identity. This is all only plausible and logical if we understand identity to be who we are. Obviously there are different definitions of this, but in this case I am referring to identity as the self, as the person we are, our personality, characteristics, mannerisms, heritage, genetics, habits, likes, dislikes, what we would describe ourselves as to others as etc. However, if we return to the basics of psychology – there are two main explanations which combine to make a plausible ‘reason’ of why something occurred in a person – environmental factors and genetic factors. For example, someone acting aggressively on a regular basis – say they have an anger management problem. When looking at the psychological causes of this, it is possible to argue that genetic factors caused the person in question to act aggressively (the biological explanation), maybe because their parents were aggressive themselves. On the other hand, there are many environmental factors that it could be put down to such as violent video games, a carer they are not related to them being aggressive towards them, or watching violent films, witnessing a violent crime etc. If we take being aggressive to be a part of one’s identity, then we can argue that some attributes, such as aggression, are not a choice, and therefore identity is not solely defined by choice, if it is at all. There are other factors involved which determine our identity that are in our genetics and our surrounding environment. If we return to the idea of identity as a path, then we say that indirectly, the choices we make define our identity. The choices we make shape the path (aka the environment in which we live) therefore this environment shapes us. There is a lot of psychological debate (nature vs nurture) about which is more important, which shapes us more, our biology or our environment? Either way, it is clear that the choices that WE personally make are those which affect the world around us, and if we take the world around us to be a factor in shaping our identity, then yes, choice does shape identity. However, I’m reluctant to use the word define… because, like I mentioned, define implies it to be fixed and unchangeable, which I don’t believe identity to be. To sum up: Batman agrees. It’s what we do. It’s our choices. Our choices define us. Whether we choose to buy the big issue or walk on by defines who we are. Whether we buy free range or organic or genetically modified will shape who we are. It will also biologically affect us… but that’s not the point. We choose things, these things affect us, that’s obviously inevitable. But it’s not the only thing that defines us. Making a few bad choices doesn’t make us a bad person. You could argue that even the bad choices shape our identity. In fact, that’s very much true. But like I say, choices are not the only things that make us who we are; a lot of it is other people, the rest of the world, ideas, experiences and a whole other lot of undefined crap. Choice does, in part shape identity, but it does not define it. Identity is made up of a combination of factors, not just the choices we make. 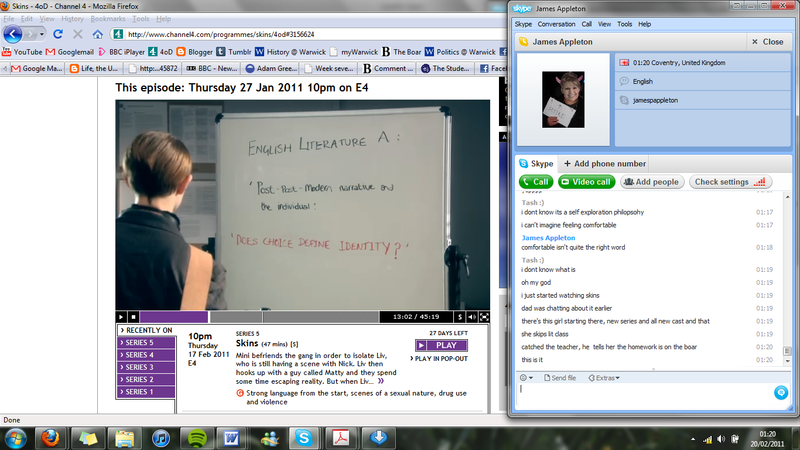 I was watching Skins and read the quote on the whiteboard, I searched for it on Google to find out who the author was. Your blog came up first in the results and I am pleased to have encountered such wise words. Well done! Thanks! It’s a fantastic series, opens up a lot of questions. But how does identity influence the choices we make?